1 column of 6 staves per page. Text is in Latin. Written in a Gothic bookhand in brown ink. Rubrics in red Gothic bookhand. Sequences begin with one-staff-high initials alternating gold with blue filigree and blue with red filigree. Verse initials begin with 1-line initials alternating gold with blue and blue with red. Bounding lines in brown plummet, full-length top to bottom and upper outer margin, writing lines in brown plummet, prickings in lower and upper margins, for bounding lines only. Square heightened stemmatic notation on a red four-line staff, c-clef indicated. Most signatures trimmed, but are visible in the lower right corner of the first half of several quires, using letters “d,” “f,” “g,” and “h” for quires 8 and 10-12, respectively. Catchwords in Gothic cursive, lower right of last verso of most quires (some trimmed). Modern arabic pencil foliation. 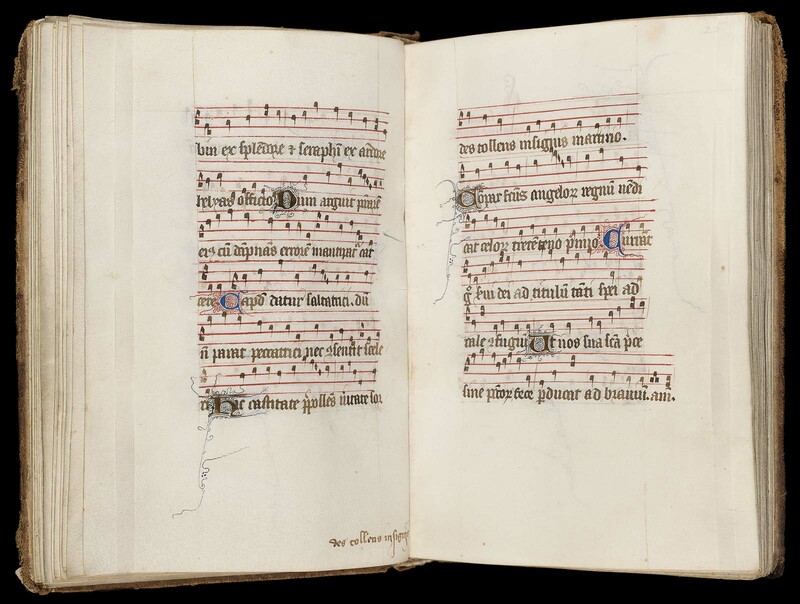 Written at the royal Dominican convent of St. Louis de Poissy (founded 1304), evidenced by the contents, in particular by the inclusion of the sequence “Regem regum veneremur” for the Feast of St. Louis (f. 33v). 18th-century cursive signature on f. i: "S[oeurs] Marie et Catherine De Tiercelin Brosses." 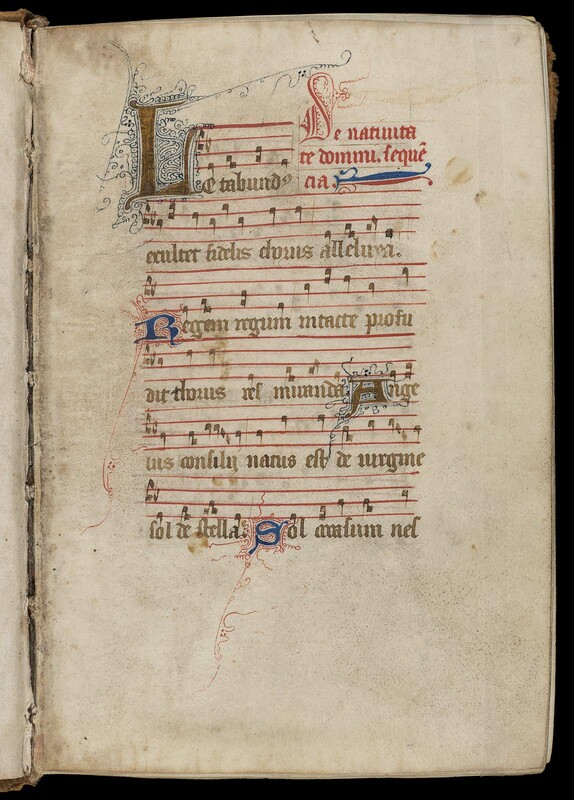 Nineteenth-century notation: "Livre d'heures des XIV siecle [ ] at sale of library of M. Cottarcue Dec. 16/87 Paris." See inscription on f. 1.